Making cream of celery soup from scratch was prompted by an excess of celery in my house. I recently joined an organic vegetable co-op and ordering from it, it took some adjustments on my end. Actually right now, I have several vegetables in excess, and some I am without. I also thought could homemade soup be better than canned soup? I know, I know, that should never be up for debate. Making cream of celery soup from scratch was prompted by an excess of celery in my house. This came about because I recently joined an organic vegetable co-op and ordering from it is going to take some adjustments on my part. I have been ending up with several vegetables in excess, and some I am without. I also asked myself could homemade soup be better than canned soup? I know, I know, that should never be up for debate, right? So, homemade cream of celery soup is far, far better than the canned variety, and I hate reading labels full of words I can’t pronounce. While I would never use this soup to make a casserole with, it’s the perfect starter to a meal. I love preparing food from scratch, and this soup is simple – chicken stock, celery, onions, a touch of cream, and some sherry. I chose not to completely puree the celery because I wanted to leave a nice texture in this soup. Did you know that April is National Fresh Celery Month? Celery is such a wonderful vegetable that it really deserves its own month. It’s high in dietary fiber and vitamin C. It’s low in calories and comes with that satisfying crunch when eaten as is! Fresh celery stalks make a great snack food for dieters and everyone else. If you are on a diet, you can even cheat just a little by dressing your stalks with low-fat cream cheese or peanut butter without breaking your calorie budget. Celery belongs to the carrot family and was first recorded as a plant in France in 1623. In the 1850s, celery seed was transported to Kalamazoo, Michigan, from Scotland, where it became a commercial crop there. Today celery is mostly grown in California and Florida. If you are interested in reading about different types of celery, click here. 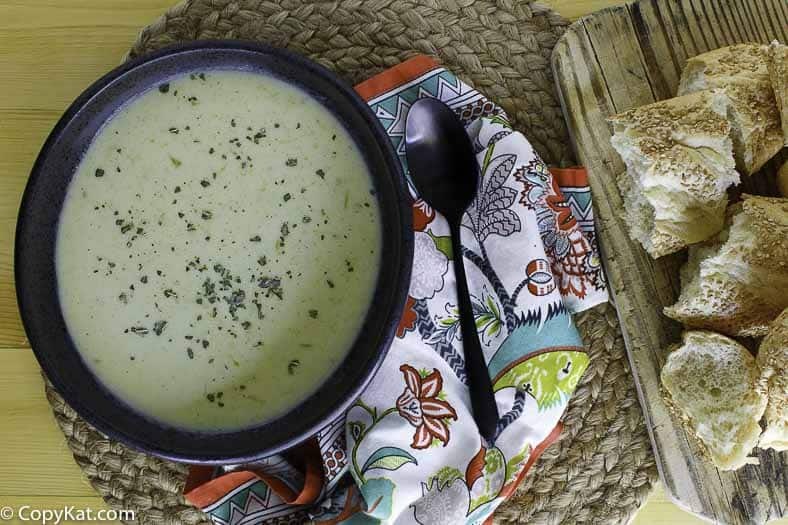 Want more recipes for homemade vegetable soups? I pulled these out for you and you can find even more by clicking on my long list of soup recipes. 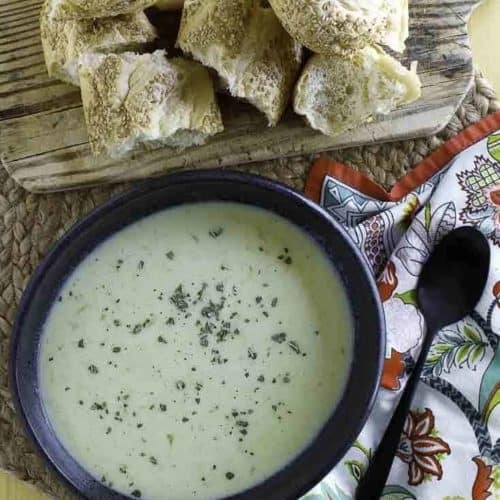 Who knew cream of celery soup could taste so good? Maybe it’s because my recipe leaves out the chemicals found in canned soups. This homemade soup is easy to make, and finally gives you something to do with the rest of the celery – so often mine has been wasted in the past. Prepare a large batch so the extra can be placed in your freezer for you to enjoy over and over again. If you are a vegetarian, you can swap out the chicken broth for vegetable broth and the butter for olive oil. This soup is even delicious without the cream. Who knew cream of celery soup tastes so good? You can enjoy this soup for a main part of your meal. Saute chopped celery and onions in 2 tablespoons of butter. Saute over medium-low heat until the onions are translucent and the celery is soft. 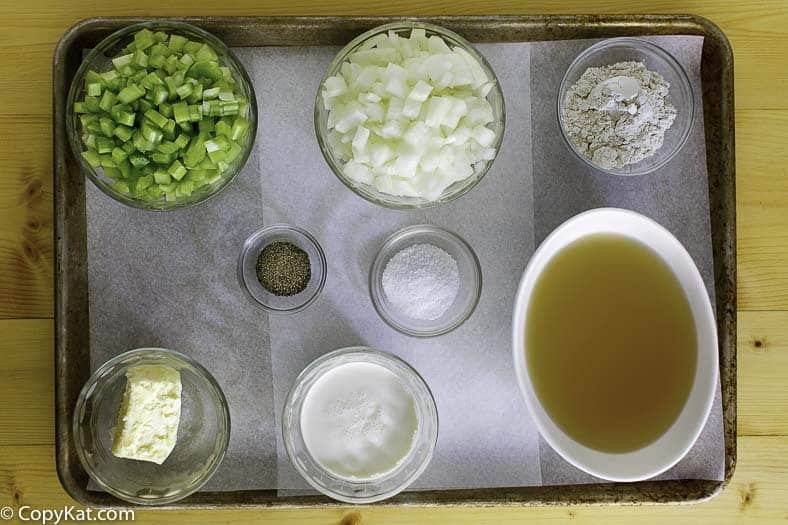 Puree onions and celery in a food processor or with a stick blender until they are at your desired consistency. Place two tablespoons of butter in a large pan, and add two tablespoons of flour and cook the flour paste for at least one minute. Add vegetables to flour paste, and then begin to add chicken stock to the pot. Turn up heat to a medium high heat, when the soup begins to bubble reduce heat, and add sherry and heavy cream. Stir to incorporate the heavy cream and sherry, when mixed well season to taste with salt and pepper. Thank you so much for posting this. I have been looking for a copycat cream of celery recipe, as I’d like to make it without the chemicals found in canned soups. I plan to swap out the chicken broth for vegetable broth to make it even healthier. (and vegetarian friendly). I really appreciate your post. Delicious without the cream! I tasted it and decided not to add cream. I used olive oil for the initial saute as well. So good! what about adding cornstarch to thicken. It would gel up then I’m positive of it. I haven’t tried your recipe yet. How ever I would like to know why you wouldn’t use it in a casserole. My mother used a can of cream of celery soup in a Green Bean casserole. Now I would like to find a low sodium alternative. Any input will be greatly appreciated. I have answered this a few times. I don’t think this soup will gel like the canned version. It’s very good, if you use it in a casserole please let me know. Why wouldn’t you use this soup in a casserole? 🙁 I’m searching for a healthy alternative to Campbell’s soup and this looks great. I just recently started to cook though and I’m wondering why this wouldn’t work in a casserole? Thanks for your feedback! If you are needing the soup to gel, I don’t think this is the soup for this. There is not a lot of thickening that is in the soup. This is very tasty to eat on its own though. Thanks for the info, Stephanie. Much appreciated. I’ll still try the soup on its own b/c it sounds delicious! WOW great recipie, thank you! Made this soup after totally over buying celery and carrots for a vegie dip for a large party. Had enough to prepare a tripple batch, very easy and made for a great fall lunch and froze the rest, can’t wait to enjoy it again! Did add the wine though…. Marking this recipe for future use — just made a batch and it’s so delicious, I don’t think we’ll have much to store for later! I used low-sodium chicken broth and cooking sherry plus the cream and butter. Next time I might up the flour measurement a bit to make it a little thicker, but flavor-wise, this is the best yet. Loved the recipe. Added a touch of cinnamon. Didn’t have sherry. Lactose intolerant, so I used powdered milk and dairy free creamer mixed 4 parts powdered milk to 2 parts creamer. Very delicious. My dog insisted on eating some, too. Next time, I’ll try the sherry version. Thanks. I haste the idea of using canned soups on recipes, but you say you wouldn’t use this in a recipe – why not? I don’t think it will perform like a can on condensed soup. This is a freshly made soup that doesn’t have a lot jelling agents. Does it taste good, yes. I don’t think it will work for some types of recipes. I didn’t test or develop the recipe for milk. I personally wouldn’t do it this way, I like the creamy texture the heavy cream gives. Would it work, yes, but it wouldn’t be as I wrote the recipe. I don’t drink milk, but I like to cook with heavy cream for a variety of reasons, so I never keep milk in the house. I just made this soup today and it was delicious. Very easy too! I am glad you enjoyed this one. I think the homemade soup is easy to make, and finally gives you something to do with the rest of the celery. So often mine gets wasted. My husband made this tonight for dinner. It was so yummy, and he added some ground beef to make it even better. I loved this story, too, though I have to say that I adored Belong To Me even more. 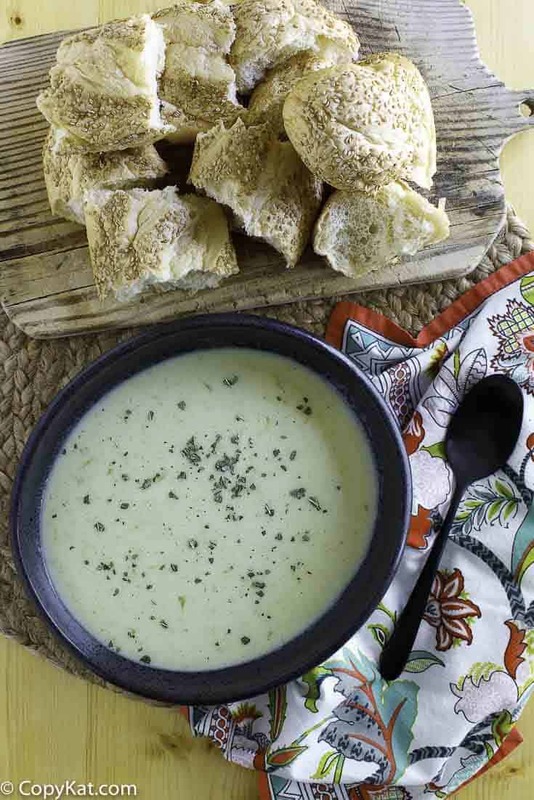 MY HUSBAND LOVES CREAM OF CELERY SOUP I AM GOING TO TRY THIS MY SUPPER TONIGHT THANKS FOR THE RECIPES. I’ve never had celery soup but I do think that homemade soups are much better than canned! I love a chowder type, without all that broth the most!